The Welsh kilt, I have had so much interest shown in this particular search term, that I simply had to write a page on the subject, even though I have already touched on this particular kilt on the "United kindom Kilts" page. The cilt (as it is known) is becoming very popular in its home country, and with exiled countrymen around the world. As the nation strive to reconnect with their Celtic roots nationalism is becoming stronger, with more and more people choosing to portray their Celtic heritage. So how does this particular kilt (cilt) differ from a Scottish or Irish kilt? Well apart from the tartan, the only other difference is that the fabric can sometimes be woven in such a way as to not have a selvage (the uncut edge of the fabric as it comes out of the loom) and in such a case the kilt then has to be hemmed. I am reliably informed that hemming the kilt does not in any way spoil how the garment hangs, or how it looks so this need not be a deterrent if you are contemplating buying one. Also these tartans tend to be woven a litter looser, and therefor can have a softer feel than the Scottish or Irish tartans. One nice touch that I've seen with these particular kilts is that you can have a red dragon embroidered on the apron of your kilt, as you can see on the photo above this certainly helps it to stand out from a Scottish or Irish kilt. The photo below shows the dragon in more detail. 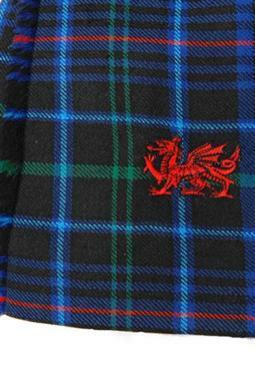 Unlike Irish tartans which are almost always woven in Scotland, Welsh tartan is indeed woven in Wales. 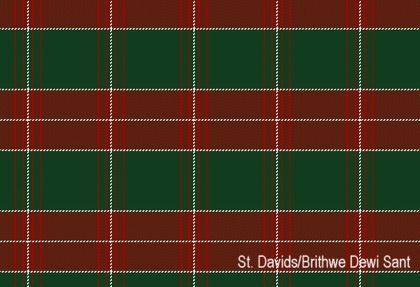 The St David's Welsh Tartan, is based on a one hundred and fifty year old Welsh tartan. So any remaining discussions on the heritage of Welsh tartans, is academic, as it has been categorically proven to have existed for a least one hundred and fifty years, probably a lot longer! 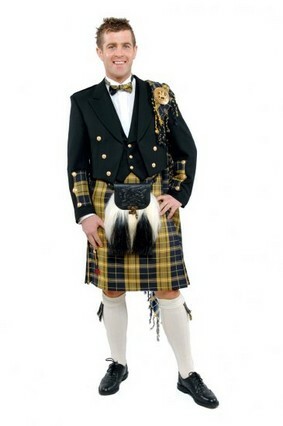 It is of course very popular at weddings, (as it is all over the world) and at many sporting events it can be seen been worn casually, for example at rugby or football matches you can often see many kilts being worn. This is quite understandable as the garment allows for freedom of movement like no other, it is both comfortable and practical, and it is therefor easy to see why the Welsh Kilt is growing in popularity so fast, all over the world.. Although it is not yet considered the countries National Dress, the kilt is certainly becoming a prime contender for that title. If you have any questions regarding this particular kilt (or indeed any other) please feel free to contact me, using the "Contact Us" page on the navigation bar. I am always delighted to answer any questions you may have, after all that's why this web-site exists, and I look forward to hearing from you.